Recently, on a call with a potential speaker for a future RTP180, we were asked "What is your motive for putting on this event?" It felt like an odd question; it wasn't one that we had ever been asked before. But after a quick moment of reflection, the answer was easy: We put on this event month after month to shine light on our amazing region, the people in it, and the talents right here in our backyard. We want to provide an authentic platform for folks to tell their story, and to leave the audience with something new to reflect on. 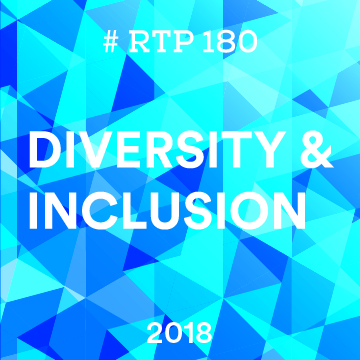 At this installment of RTP180, we'll be talking about the diversity of this region, and the efforts we as a region have been making toward inclusion. What can be done better? What efforts are being made now? Join the discussion July 19. If you or someone in your party is deaf or hard of hearing, please make this selection at checkout to reserve a seat near the interpreter. Can't attend in person? The event will be livestreamed here beginning at 6pm on Thursday, July 19. A day or two after, we will have it hosted on our website here.